Lyophilised concentrate of fruits of FLAVIN7. 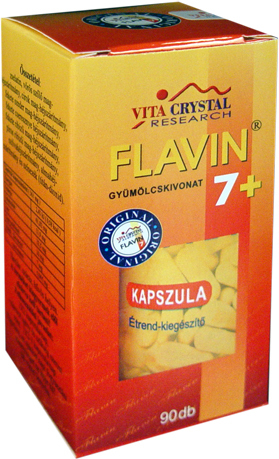 The effect of capsules equals to that of FLAVIN7 drink, moreover it contains colin and amino acids. Its active agent content gets absorbed in the intestines. It is especially recommended to take in case of stomach conditions and for patients with hyperacidity problems. No need to keep it in fridge, available in put-ups of 30 or 90. Recommended daily use: in preventive care 2 x 2 capsules, in complementary therapy 4 x 2 capsules. The drink and capsules can be consumed simultaneously, too, 10 ml of drink equals to the content of 8 capsules.